In these vans, the fuel pump sits in the fuel tank, and is mounted there via a port at the top-front of the tank. You’ll need to raise the back of the van and then lower the tank, to get at the pump and do the repair. c) the pump was apparently the original, 15+ years old, so it seemed reasonable to replace it for reliability reasons. Usual disclaimer: I take no responsibility for injury or loss that may result from following any parts of this how-to. Due to the fuel and fuel vapour that will be present, plus the fact that some of the time you will be working underneath part of a heavy vehicle with part of it elevated, there is risk of fire, explosion, injury and even death, if you get any of this wrong. Be careful! 1. You absolutely MUST do this job in a well-ventilated area. In my case, I did the work in my backyard garage as shelter from the Vancouver rain, but kept both front and back garage doors open to have some air flow. 3. Wear safety glasses, the wrap-around kind, so as to protect your eyes from potential gas splashes and falling debris while you are working below deck. 4. During handling of the fuel-exposed parts of the repair, use gloves that won’t dissolve in gas, in case you get any on your hands. Any auto parts store will have these. 5. Try to keep fuel fumes to a minimum by having the fuel system open no longer than necessary. That means having all the parts and tools that you are likely to need ready and close at hand. 6. If your vehicle is still ambulatory, e.g. the pump hasn’t actually failed, try to run the gas down so you have less than 1/4 tank, so as to avoid spillage and reduce the tank mass that you will need to move around. Otherwise, you should siphon excess gas from the tank using a siphon kit or equivalent (don’t use your mouth to start the gas siphoning). 1. Ramps or other way of raising the back end of the vehicle (see procedure details below) plus jack stands or blocks as backup. I have some inexpensive steel ramps purchased from Canadian Tire that provide about 10″ of elevation. That was sufficient for this job. 2. 2 scissor jacks (the type for changing tires) or equivalent, for doing controlled lowering of the fuel tank. Using 2 jacks makes it vastly easier to balance the tank, and that’s a lot safer if you still have any gas in it. In my case, I used the tire jack from the van, plus one borrowed from this Subaru Outback. 3. 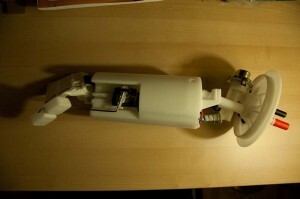 A good replacement fuel pump. In what I could find on line, I saw very negative comments on the reliability of the common cheap, sub $100 pumps from manufacturer Airtex and some others. Found good reports for Delphi, Bosch, and Hella pumps. These seem to be typically $130 to 300. In my case I stumbled onto an “open box deal” on a Bosch model 67642 pump for $55 on Amazon.com so I took a gamble on the open box and bought it. I also saw some good deals on apparently the same pump on e-bay but be sure you are buying from a reputable vendor. The pump turned out to have Walbro molding marks on the head despite the Bosch sticker, so I was suspicious at first of it being genuine, but it turns out that Walbro does make the US versions of these pumps. 4. A socket wrench set. All you really need from it here is a 15mm socket and a 6″ extension, for removing the 4 bolts holding the fuel tank straps. 5. A special wrench for unscrewing the approx 6″ diameter plastic “jar lid” -type nut that holds down the fuel pump top surface onto the fuel pump port in the fuel tank. See below for how I made my own such wrench. Some people have been able to get that nut off using a strap wrench, but my nut was stuck on and I broke a strap wrench trying that method. In my case, the fuel pump jar nut was really stuck on. Various things I tried to release it failed, including strap wrenches, and just hammering on the protruding tabs on its perimeter using a blunt punch. I actually broke off a tab right away using the latter approach, and I even broke a “Boa Constrictor” strap wrench too in an earlier attempt-we’ll see how good the warranty on that tool is… .The proper OEM special tool for this job sells for around $130 online if you can find one, and Babco Tools and other sources sell a general application fuel pump removal tool for this for around $35 but that one looks like it doesn’t have enough clearance under it for the fuel pump tubes on the Caravan. I wasn’t willing to order the special tool and have to wait for it, and I decided I needed a new approach. Having recently been watching the documentary “Alone in the Wilderness” about Richard Pronneke, l was inspired by his carpentry, done with only basic hand tools. I went ahead and made my own custom wrench out of some wood bits of about 1×2 cross-section that I had lying around. 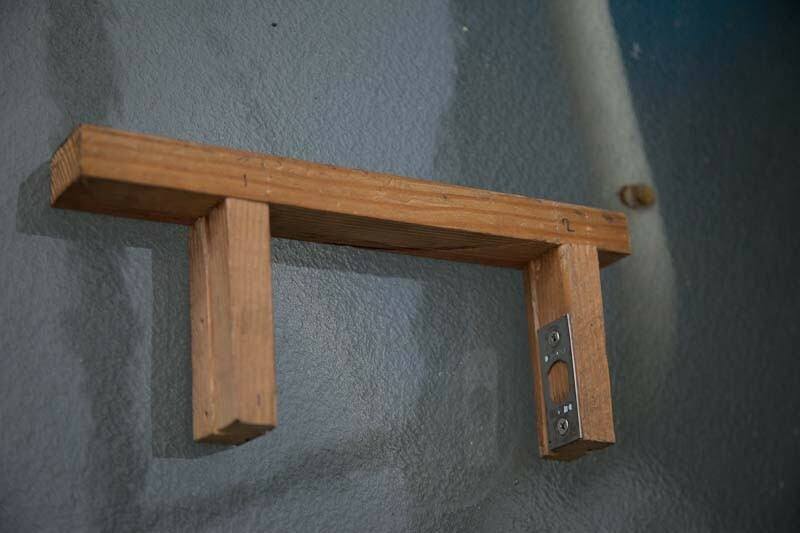 Per the picture, I made 2 posts with slots on the inside, cut with a mitre saw, to fit the diametrically opposite jar nut tabs, mounted on a longer horizontal bar with long wood screws. This was sized so as to have a mild interference fit between the posts and the lid. The horizontal bar was sized just long enough to be able to rotate it in the space available above the lowered tank, maximized to provide some torque. First attempt, not surprisingly, the wood on the side of the post slots broke under the big force I needed to apply, and the nut still didn’t budge. So, I rotated the posts 180 degrees, cut new slots, and reinforced the slot edges by screwing on two leftover steel “strike plates” from some door lock work that I had done recently, to have a hard, strong metal edge against the nut tabs. Success! With that mod, I was able, with a lot of force applied, finally to loosen the “jar lid”. I also made a second version of this tool, with the strike plates on the opposite sides of the cut slots, for tightening the nut down at the end of the repair, but if you make the posts wide enough for 2 opposing plates plus the slot width, or have other metal bits to work with, you can easily get by with one tool. But note the procedure steps below before you get that far. 6. Not essential for this particular job but it helps to have the Haynes manual for this series of vans. It has pictures, specs, fuel system repair procedures, and much more. It’s great – just get it. I found with the Haynes manual, I had no need for the official shop manual. YMMV. Here are Amazon links for the manuals for various model years of these vans. Note that if you buy either manual by clicking on the appropriate image, I get a small commission. Even better, if you really want to help support a starving author, you can buy my new book Dog Friends. 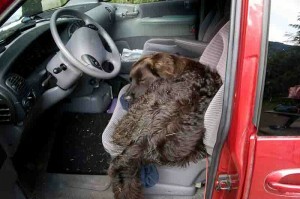 Dogs often ride in vans . Click on the image to the right for details and previews. And please look out for my forthcoming book about repair! 1. Back the vehicle onto your ramps. Back the ramps up with axle stands under the rear axle or blocks. Put the parking brake on and put chocks in front of the front wheels. 2. Disconnect negative terminal of battery once vehicle is positioned on ramps. 3. Release fuel pressure: undo the tank cap, and release the Schrader valve on the fuel rail (the valve is in the lateral centre of engine, near the front). Just remove the cap on the valve and depress the pin with a suitable tool e.g. a Robertson screwdriver to release pressure. 4. The fuel tank is positioned on the driver’s side of the vehicle, and is held up by 2 straps with a bolt holding each end of each strap to the body. To lower the fuel tank, rather than try to balance the tank on one support, as some of the instructions I’ve seen do, I decided to use 2 scissor jacks, one that came with the van, and the other borrowed from my trusty Subaru. Position the two jack stands one near each end of the tank so as to have it reasonably balanced, with wood blocks between them and the tank to spread the load and protect the tank. You might want to back those jacks up with blocks of wood in case they tip. Remove the four tank strap bolts using a 15mm wrench. There are typically 3 stacked washers per bolt between the strap and the van body. Watch for those as they will probably fall down in the process. 5. Lower the fuel tank by turning the screws on the jack stands so as to keep the tank level. This is a light load compared to what the jacks are designed for and you will probably be able to turn the screws by hand, for both raising and lowering. 6. Remove the electrical connector from the fuel pump head. To do this, you need to push the red locking tab on the connector sideways, towards the pump centre, and then gently pull the plug out. This cleared the way for the rotation of the jar nut wrench in the next step. I left the fuel connectors on at this stage to have the minimum gas fumes present. 7. Now the hard part, for me, anyway. Loosen that darn plastic jar nut that holds the pump head onto its o-ring. Note my comments above about the custom wrench I used. This will likely take a lot of torque. I also used a big hose clamp around the posts of the wrench and the jar lid for added strength. Wear gloves to protect your hands in case anything slips. All you want to do at this point is loosen the nut. Full removal comes a bit later on. 8. At this stage, remove the fuel lines by releasing the “window” connectors at the fuel pump heads by pressing inward on their tabs. (sorry, no pictures but pretty obvious). 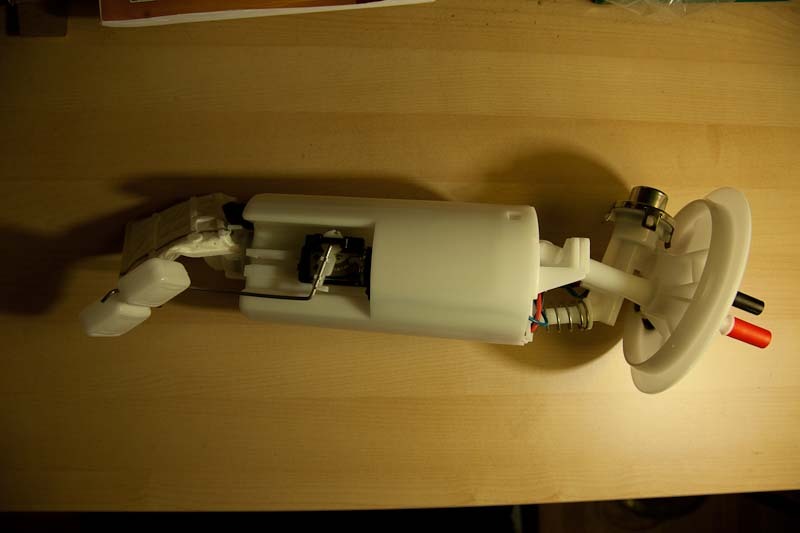 Now fully remove the jar lid nut and carefully pull the old pump out, and also remove the sealing o-ring. Before you put the new pump in, carefully install and seat the new o-ring that typically comes with the new pump. Then put the new pump in quickly to avoid inhaling the emanent gas fumes, and re-install and tighten down the jar lid nut again. For the tightening, I used the second version of my wrench per the above note. The spec torque for the jar nut is 40 ft-lbs. Of course, it is critical to not have leaks in the fuel system, and since I didn’t trust a torque measurement by itself, on such a sticky, high-friction plastic nut that had been so much trouble to remove, I also inspected the inside perimeter of the nut around the whole circumference while tightening it. You’ll know that you are getting close to the required torque when the nut edge is in full contact with the pump top surface, and you need to go a bit past that rotation to be sure of applying force to the o-ring. In my case, that took a lot of applied force on my custom wrench, using a hand on each side of it. Wear tough gloves to protect your hands in case something slips; I’ve had enough “car bites” from my years of tinkering to have learnt that lesson! 9. Reconnect the fuel lines and the electrical connector. Inspect for any fuel leaks. 10. Re-install the fuel tank into position by carefully raising the jacks, and putting the bolts back in. Don’t forget the 3 washers per bolt mentioned earlier. They go between the body and the end of each strap. 11. 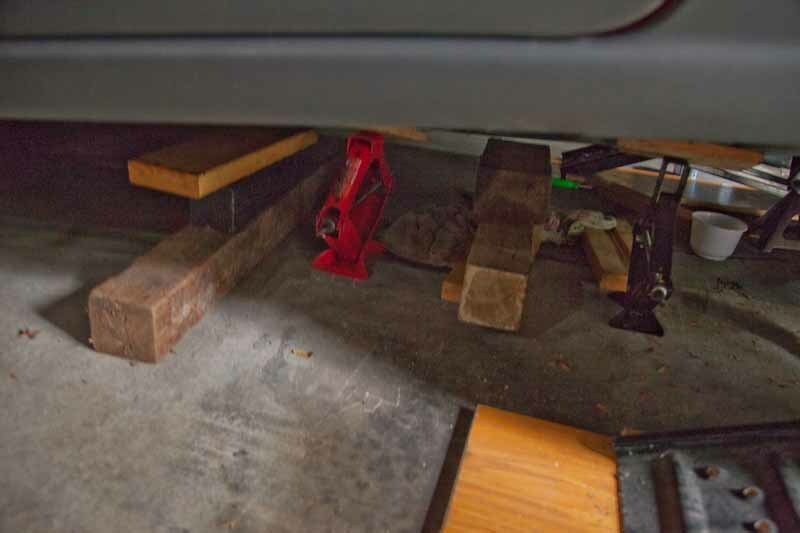 Clear the jack stands, wood bits, tools and so on from the area. Move the chocks away from the front wheel. 12. Re-pressurize the fuel system. The way I do this is to turn the ignition key only to “on” for just a few seconds, and repeat that about 4 times. Don’t start the vehicle yet. 13. After pressurizing, peer underneath to check for any fuel leaks. If all clear, try starting. With success, take off the parking brake and cautiously drive off the ramps. Park somewhere safe and well-ventilated, and check underneath again for fuel drips, just to be sure. Of course, Gimli is happy to have his adventure van back on the road. Happy repairing! Watch this site for a new book about repair, coming soon from me! Thank you so much for taking the time out and writing this detailed description of replacing a fuel pump. Awesome details and pictures! I didn’t even know the fuel pump was mounted in the tank on these beasts. Now I can fix my ’97. What if I just topped off the gas tank. Tank is full to brime. 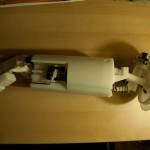 You can get a siphon kit from many parts suppliers. Hi, Shane. Ha. Perhaps, but the “woodwork” took all of a few minutes. I like your method better than mine in general, but in my case, my strap wrench broke, so your method wasn’t possible and I needed an alternative. Glad you got yours fixed too. Cheers.